Slow Cooker Beef Brisket & BEST EVER Homemade BBQ Sauce -VIDEO! 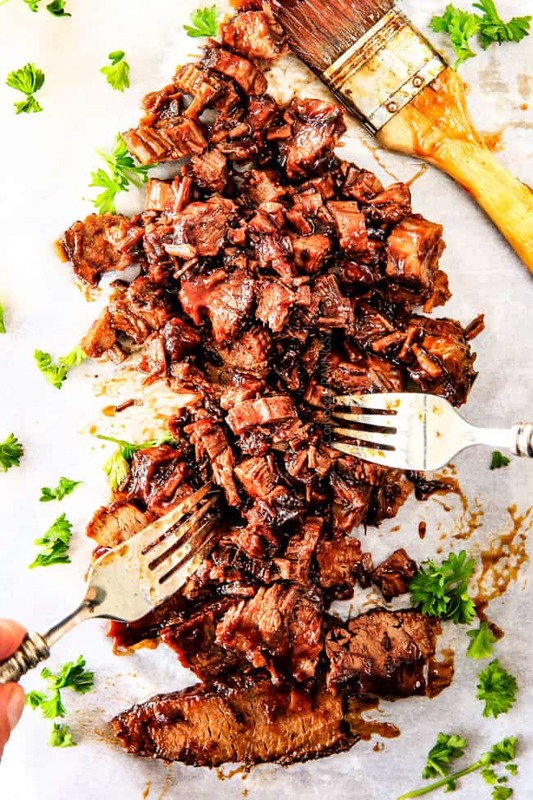 This Slow Cooker Beef Brisket Recipe is wonderfully juicy, flavor exploding, melt-in-your-mouth and “better than any restaurant” according to my food critic husband! Beef Brisket can be prepared many ways – there’s smoked beef brisket, oven beef brisket but I’m telling you this Slow Cooker Beef Brisket recipe is my favorite method for juicy, flavor exploding beef brisket! And it’s SO EASY! It’s the ultimate stress free company dinner because it can be made days in advance then reheated in the slow cooker for stress free entertaining (which is actually my preferred method)! I have been giddily waiting to share this Beef Brisket Slow Cooker Recipe with you because it is Christmas worthy!! I truly love this Beef Brisket Recipe more than my crazy popular Slow Cooker French Dip Sandwiches, Slow Cooker Barbecue Ribs, Slow Cooker Carnitas, etc. I know that is a bold statement, but this brisket is boldly delicious. As Patrick and I stood around devouring this meat the second after I finished photographing, effusive oohs and ahhs was all that could be uttered until we couldn’t stuff our faces any more. 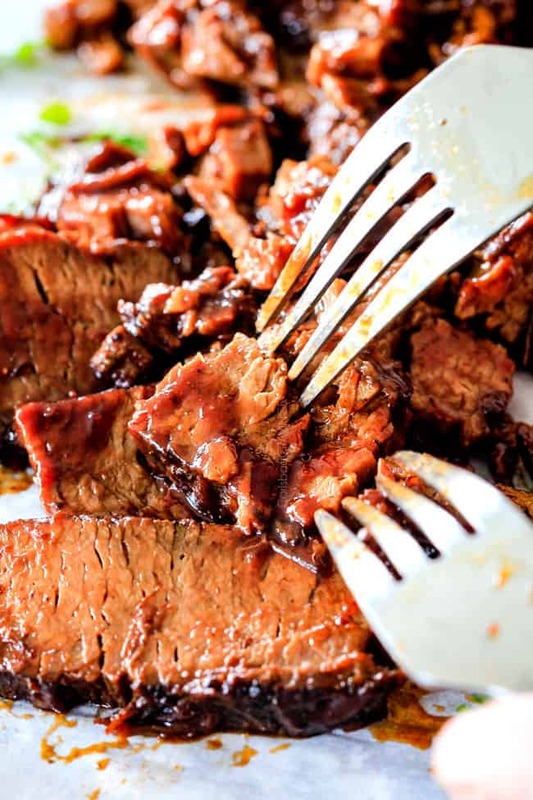 So if you have never made beef brisket or never made slow cooker beef brisket, prepare for your mind to be blown with this easy method for crazy tender, juicy beef brisket every single time. Beef brisket boasts the richest natural flavor of any cut of meat and is my choice meat whenever I dine at any barbecue restaurant. 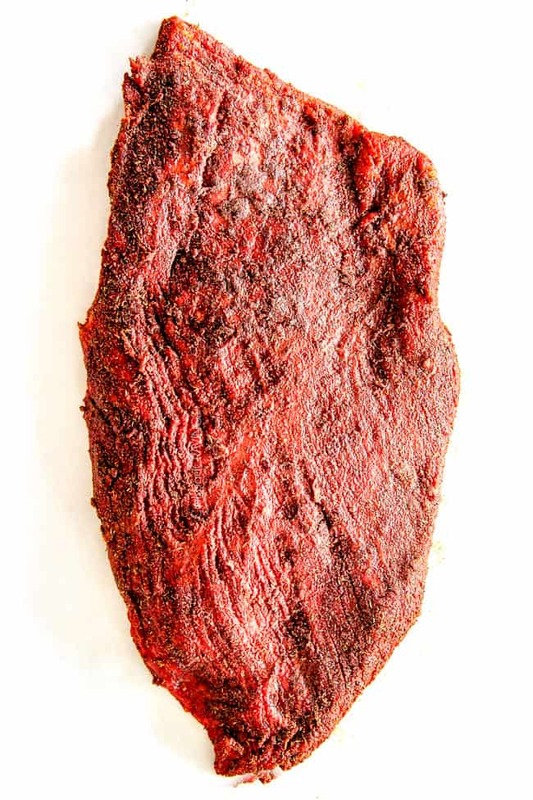 The flavor comes in part from the extra long cooking time required to break down the fibers of the meat as brisket comes from the front breastbone of the cow so there is a lot of connective tissue and muscle that supports much of the weight of the cow. This means brisket holds its shape so you can either slice it OR shred it, unlike chuck roast and short ribs that shred easily when cooked for a long period of time. Why this is important is that you don’t have to worry too much about overcooking your beef brisket because it will hold together to the point of being shreddable. When I cooked this beef brisket, it was sooooo tender but I was still able to slice it AND I was still able to easily shred it as well. This also means beef brisket is ideal for slow cooking and ideal for stress free entertaining. 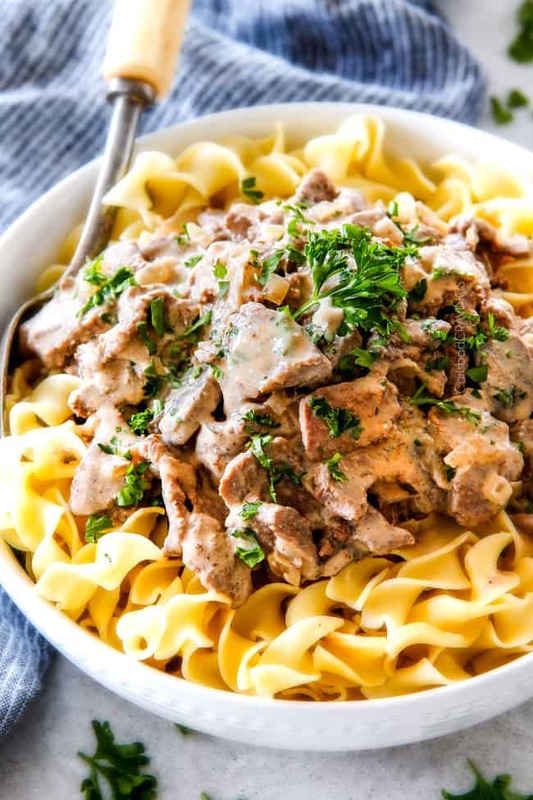 I love using my slow cooker during the holidays because not only does it free up the oven, but the results are wonderfully tender and every bit as delicious as oven results. 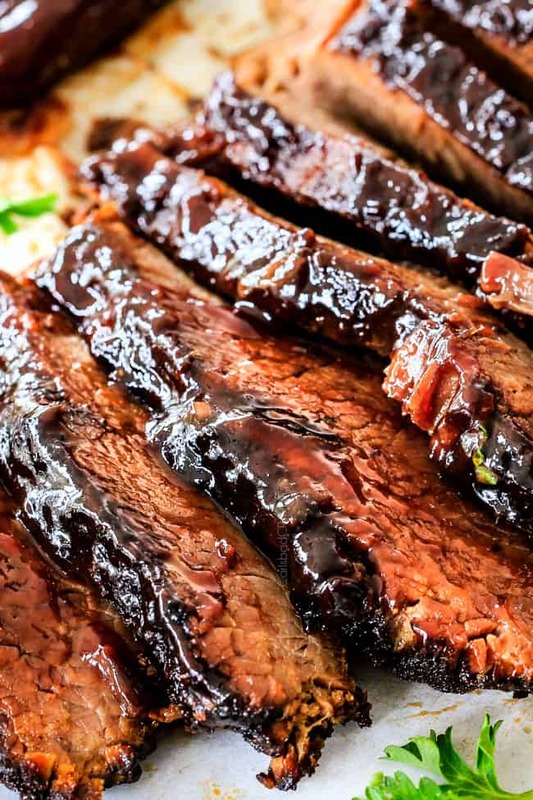 Making and serving beef brisket on the same day can be difficult, however, unless you plan ahead because the brisket requires a good 8-10 hours of cooking time. That is why I like to prepare my brisket the day before. 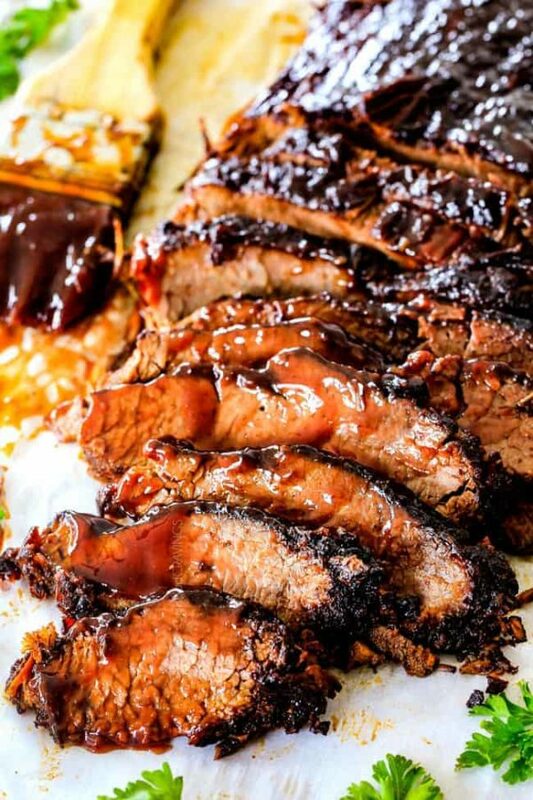 To do this, we first make our brisket by rubbing it in our custom spice mix that elevates this Slow Cooker Beef Brisket to restaurant quality. The Spice Rub is an intoxicating blend of paprika, brown sugar, chili powder, chipotle powder, onion powder, garlic powder, dried thyme, salt and pepper. The rub is not too spicy, not too sweet, but just plain flavorful. Next, we oven sear the beef brisket by simply baking it at 425 for 30 minutes. This seals in the spices/juices, renders some of the fat and adds a depth and complexity of flavor that can’t be achieved any other way. Meanwhile, we whisk up our tantalizing homemade barbecue sauce that I first used in my Slow Cooker Barbecue Ribs and my Crockpot BBQ Chicken. This Barbecue Sauce is a reader favorite and the “only barbecue sauce I will ever use,” according to many. So while you can use your own bottled barbecue sauce, I highly recommend this version. It is sweet and tangy and just right. After your beef brisket is cooked, this is when I remove the slow cooker ceramic insert and refrigerate it with the brisket and all the juices for 1-3 days. Not only does the flavor improve, it becomes even more tender and makes prep the next day a snap. When ready to serve, simply skim off the hardened fat then cook on low for 1-2 hours until warmed through. At this point, you can serve as is, or I like to remove the brisket to a foil lined baking sheet and smother all over with our homemade barbecue sauce and broil for 5-10 minutes, until slightly caramelized which enhances the savory meaty, complex “nutty” flavor. 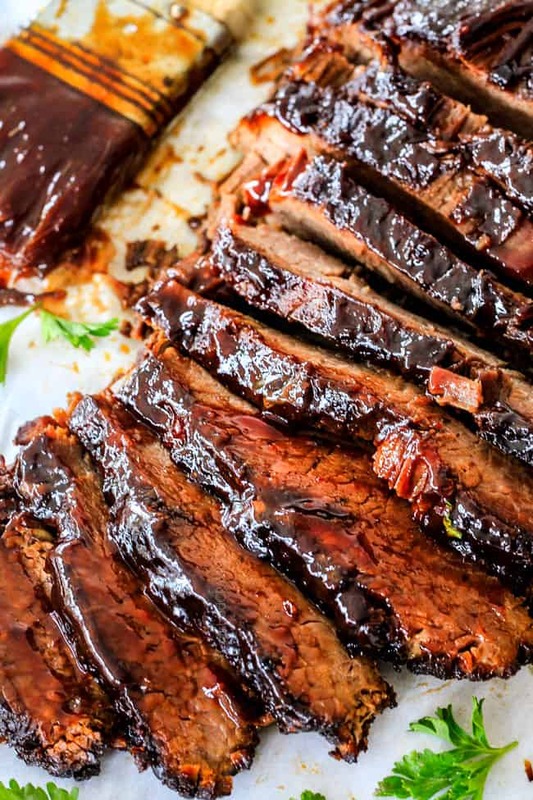 Your now fork tender, flavorful, juicy, rich Slow Cooker Beef Brisket is ready to be sliced across the grain or shredded and slathered in tangy barbecue sauce. 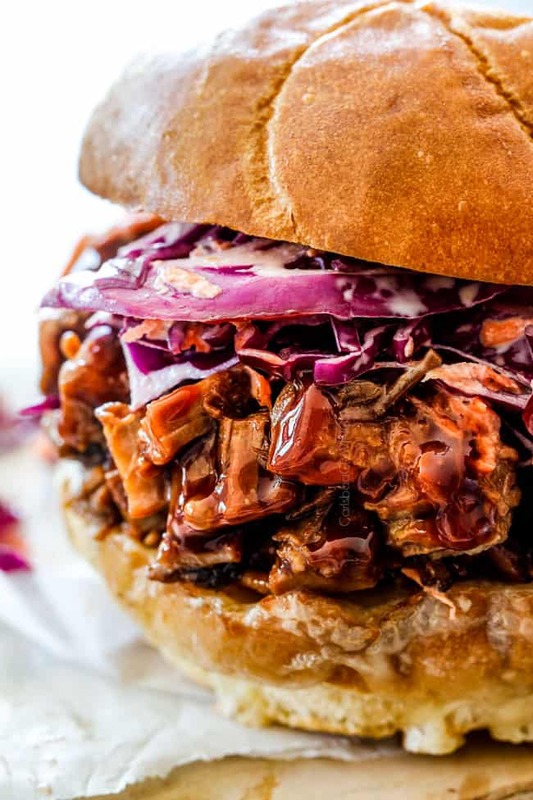 The brisket can be served as is or piled high on a bun for the Best Beef Brisket Sandwich of. your. life. Any way you serve it, this comforting, convenient, luxurious beef brisket will have you and all your guests “oohing” and “ahhhing” for more! If you are looking for more meaty sandwiches to love, I highly suggest my Slow Cooker French Dip Sandwiches, Slow Cooker Italian Beef Sandwiches, Slow Cooker BBQ Pulled Pork Sandwiches and my Philly Cheesesteak Sandwiches. They are EPIC. What Should I serve with Beef Brisket? Want to try this Beef Brisket Slow Cooker Recipe? Pin it to your SLOW COOKER, BEEF, or BARBECUE to SAVE for later! 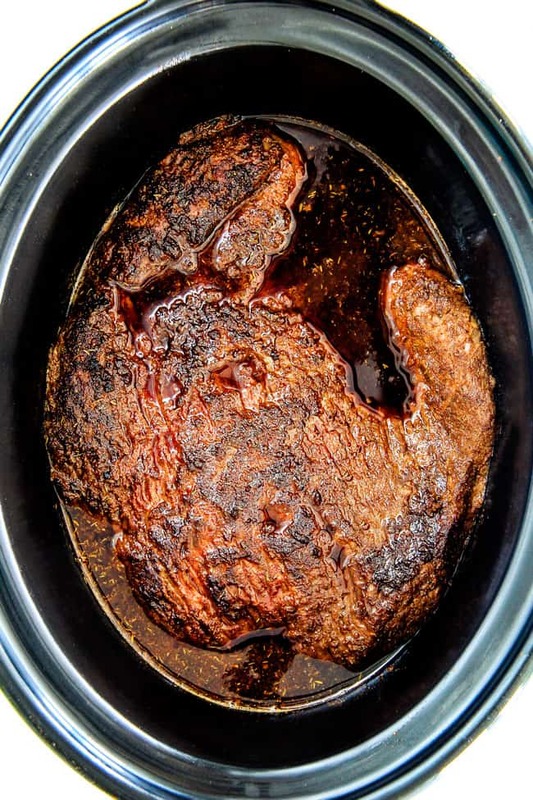 Wonderfully juicy, flavor exploding, melt-in-your-mouth Slow Cooker Beef Brisket is "better than any restaurant” according to my food critic husband! It's the ultimate easy company dinner because it can be made days in advance then reheated in the slow cooker for stress free entertaining (which is actually my preferred method)! Preheat oven to 425 degrees F. Line a large baking sheet with sides/jelly roll pan with parchment paper or foil for easy clean up. Set aside. Spray 6 quart (or larger) slow cooker with non-stick cooking spray. Trim brisket of excess fat and rinse and pat dry. If your brisket is extra long then slice it in half so it will fit in your slow cooker. In a medium bowl, whisk together Spice Rub ingredients. Remove 1 tablespoon Spice Rub and add to a medium bowl to use in your barbecue sauce. Rub all remaining Spice Rub evenly all over the meat then place brisket on prepared baking sheet. (You can let sit at room temperature for 30 minutes or refrigerate up to 24 hours if desired). Bake uncovered for 30 minutes at 425 degrees F to sear meat. 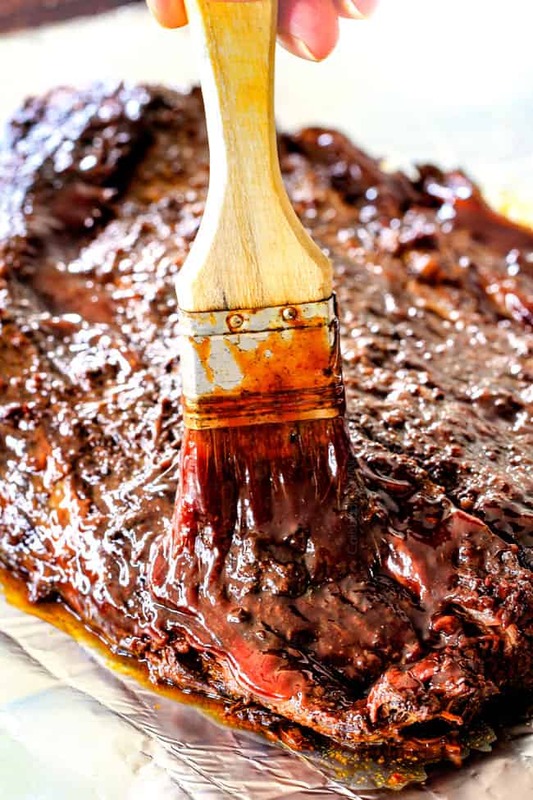 Meanwhile, add all of the Barbecue Sauce ingredients to the 1 tablespoon reserved Spice Rub and whisk to combine. 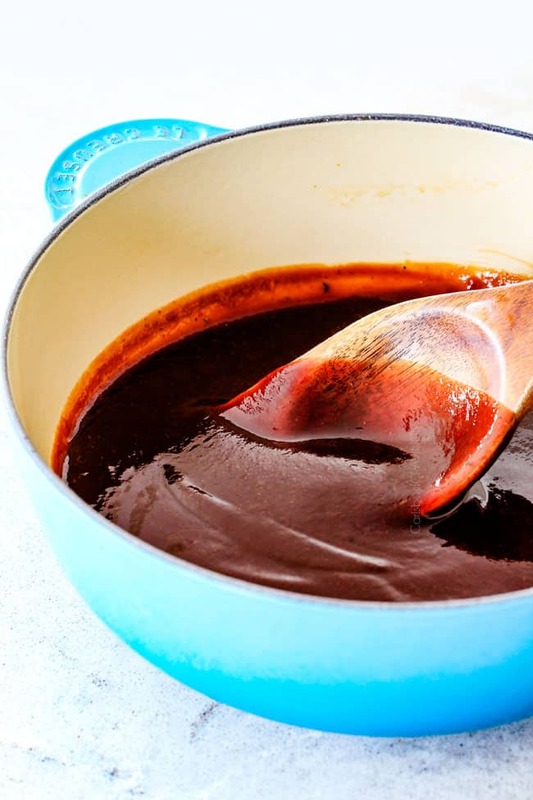 Remove 1/2 cup barbecue sauce and add to slow cooker along with 1 cup water, 2 tablespoons Worcestershire, 1 tablespoon reduced sodium soy sauce and 1 tablespoon beef bouillon. Whisk to combine (the bouillon will not be completely dissolved but will dissolve during cooking). Using tongs (so you don’t burn yourself) carefully transfer brisket to slow cooker. It will be large so you will have to squish it in. Not all of it will be under the liquid. Cover and cook on LOW for 8-10 hours until brisket is very tender, flipping over half way through cooking. If your brisket is tough, it just needs to cook longer. Remove brisket to a foil lined baking sheet. Brush with barbecue sauce and broil 5-10 minutes, until slightly caramelized. Meanwhile, microwave or simmer remaining barbecue sauce until warmed through. MAKE AHEAD: I often will cook my brisket until tender then remove the removable ceramic insert and refrigerate the brisket in the juices. The next day, I skip off all the hardened fat then cook on LOW in the slow cooker for 1-2 hours until warmed through and proceed with recipe. *Liquid smoke can be found next to the barbecue sauce in most grocery stores. It adds a wonderfully smoky flavor. This post first appeared on The Slow Roasted Italian website where I am a contributor. This recipe sounds so good. My husband usually smokes brisket. Can’t wait to show him up on this one. LOL! I think you will! Let me know how your brisket turns out! Though I’ve eaten brisket, I’ve never cooked it before. I can ruin any cut of meat known to man, due mainly to inexperience and a dearth of practice. The brisket I purchased was expensive and terrifying in its possibilities; I could either mess it up it or create a family favourite. Your recipe was an eye-opener. It actually rivals the brisket the best Memphis-style restaurant in town serves – meltingly fork tender, huge flavour and a great barbecue sauce I’m going to use on ribs next! Thank you for taking the mystery out of one of my favourite dishes. (My husband thanks you, also, as he has to eat my disasters.) I served it with baked beans, coleslaw and the cornbread from your site. That cornbread is absolutely killer. I’ve had to freeze half of it so that I wouldn’t eat it all! I’m so proud of myself, and so thankful for you and your recipes! It was wonderful to wake up to your comment this morning, thank you so much Judy! I’m so pleased this brisket is a new family favorite and rivals your favorite restaurant! Your entire meal sounds fabulous! I think you will love the ribs as well – congrats on a job well done! I made this for news years. Fantastic, fantastic, fantastic! The bbq sauce is to die for. This recipe is keeper. Awesome Ledie, I’m so pleased it was a winner! Happy 2019! Would London broil work instead of brisket? Hi Erin, no I don’t recommend London Broil because it is much leaner, less flavorful and easy to overcook. You can try it but be sure not to overcook it. I hope that helps! Hi Jen, just one quick question. When you say “1 Tablespoon of bouillon” , can I use 1 tablespoon of “better than bouillon beef base” or do you mean the bouillon powder? Thanks in advance! I’m crazy excited to make this brisket very soon. Hi Jill, yes, you can absolutely use better than bouillon! enjoy! Do you really put it in the fridge for 1 to 3 days? I was hoping this could come together in one day. Hi Lisa, no you can cook it all in the same day. The 1-3 days is just an option to make ahead. I am going to attempt to make brisket for the first time using this amazing recipe. I don’t know anything about brisket but doing some research there are different cuts of it. flat and point. Which do you use for this recipe usually? Great question Julia! It is flat cut. Enjoy! OMG, Jen, this is amazing. I can understand why you and your hubs stuffed your faces!! I haven’t broiled it yet only just took it out of the slow cooker and it is yummy! That bbq sauce is the best I’ve ever had. I grew up on bbq sauce like this and when I tasted it my childhood came crashing down around me. We aren’t having this until Sunday so it has almost 2 days to sit in the juices before I broil it and slice it!! My hubs wants to eat it now and get more tomorrow to serve to our guests. There will be ham, turkey and the brisket at the dinner and I’ll wager the brisket disappears fast and there will be folks wanting the recipe. Thanks for sharing. Thank you so much Carol for making my day! I’m thrilled you love the brisket AND the barbecue sauce! I’m sure it is going to be even more amazing after sitting for two days! I hope your guests absolutely loved it!